Customer Feedback Never ones to blow our own trumpets, (well, not too much), here's some comments from some of the customers who have let us be a part of their special day. Just wanted to drop you a quick not to thank you so much for the ice cream bike at our wedding. Our guests loved the ice cream and thought it was a lovely touch (especially that it was so hot). It looked beautiful too and i love the blue bunting around the umbrella. Thank you for travelling the extra distance after taking on the extra work, it was very much appreciated. I just wanted to say a big thank you for your ice cream services on our wedding day - especially if you brought that gorgeous sun along as well :-). Everyone thought the ice cream was super cute and really made the day unique - I've heard that a few guests tried 2-3 different types making the most of the short reception period (as the bride was a bit late getting to the Church). I'm pleased that you enjoyed going to a new venue - hopefully you had a chance to provide your details to our wedding planner as she organises functions for a number of locations in the area and it really was a big hit! It was brilliant. Thanks Sooo much, we truly enjoyed every minute. Everyone commented on how brilliant your ice cream bike was and how lovely the ice cream tasted! The bike looked fantastic too and the bunting amazing. We really do appreciate all the hard work you did. Thanks so much. Great to hear from you, sorry for the delay in getting back to you. We’ve just returned from a wonderful honeymoon in Italy and now back to work, trying to catch-up! It was great seeing you at the wedding and I’m sorry I couldn’t spend more time with you, was just a whirlwind of a day!! Everyone loved the ice cream in particular Zack my stepson – who I remember shouting to me from the lower terrace… FREE ICE CREAM! Thank you for your service on the day and your kind wishes. We absolutely had a lovely day and many commented that the ice-creams are yummy! Thank you so much!! The ice cream went down very well and the bike looked amazing, especially the pink bunting! We managed to get the ice cream done before it started pouring so it all worked out very well. We will definitely recommend you! What a wonderful reaction to your ice cream cart. Everyone was discussing flavours and who had what. The cart looked perfect and was totally in keeping with the theme. Thank you again for such a lovely addition to the wedding. 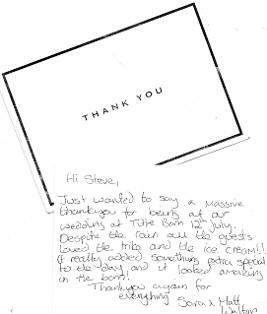 "Thanks Steve - wicked ice cream - all guests loved it! Alex - the restaurant manager likewise impressed - so you may get some additional business there. A lot of the young ones are proposing future nuptials so have passed on your details. Thanks again for making George & Nick's day special. They loved your ice cream bike. "Thank you for the fun and yummy ice-cream at our wedding! It was such a great touch and our guests loved it. 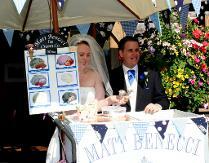 Me and James also loved our special bride and groom cone - I just wished I had had the room for one of each flavour! :-)"
We loved having you and the bike at the wedding, and the guests certainly enjoyed the ice cream! We will definitely recommend Matt Benecci trikes to anyone looking for something different for an event. We're just back from a fantastic honeymoon and have just seen your email. Thank you so so much to yourself and Sharon for being part of our day - we loved the ice cream bike and the ice creams and all the guests haven't stopped talking about it. I'm glad Emma was able to help you with the early set up so you could multi task. The Guests loved the ice cream! we just got back from honeymoon last night and already we are hearing that it was such a lovely touch to the wedding! "Hi there, the weather was fantastic. Thank you as well for serving such delicious and wonderful ice cream, everyone enjoyed it very much and commented wonderfully on your service and ice cream. The rest of the evening went perfectly thank you." Thank you very much for the email - I was just going to send you one! Thanks very much for doing such a good job at our anniversary party on Saturday. Everyone thoroughly enjoyed the ice cream, it was the highlight of the afternoon - for people of all ages! I'll definitely be recommending you at every opportunity! I hope the wedding you went on to went OK and enjoy the rest of the summer. I am sorry that I have not emailed back sooner- We have just got back from our honeymoon! I just wanted to say a massive thank you- the ice creams were greatly appreciated by all and we loved the Ice Cream Trike! We will be sure to recommend you to everyone we know! Thanks also for the photo- it is great, we had such a lovely evening. Please could you send me your postal address? 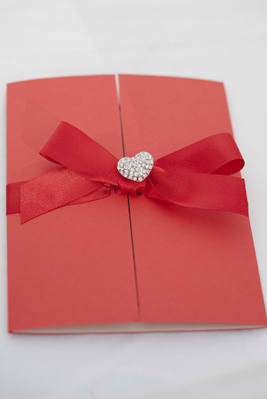 I would like to send you a thank you card for your efforts on the 16th July at Hamptworth Lodge for our wedding. May I say now - the service was outstanding and we really where very impressed. I have also attached some photo's of us with the ice cream trike as I know that you were keen to get some for your website!